This spacious 3 bedroom apartment for sale, measuring 125 square metres, is a premium property with fittings and furnishings of a very high standard. 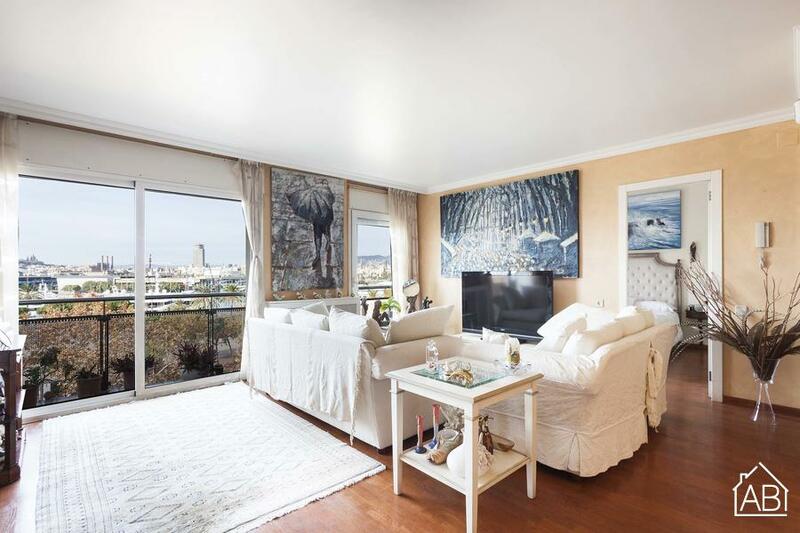 It sleeps us to 6 people and boasts a fantastic location on Passeig de Joan de Borbó right by the Mediterranean Sea, just steps from the beach, offering an unparalleled aspect with views over Port Vell and across the city to Montjuïc and Tibidabo Mountain. The neighbourhood has lots to offer, with buzzing cafés, brunch spots, restaurants and beach activities nearby. The location of this apartment is excellent, with easy walking access to the city centre and just a short walk from Barceloneta metro station, taking you to other parts of the city. The spacious reception room features a large living area for sofas, a flat screen television, storage units and coffee tables, as well as a dining area where you can enjoy evening meals with family or friends. The whole space is flooded with natural light from the floor to ceiling glass doors that span the width of the room and open out onto the private balcony, overlooking the port and the city. The spacious master bedroom features a large double bed and lots of built-in storage units. Just like the living area, the bedroom also benefits from view over the city, also having a glass door out to the balcony. Further cupboards in the corridor offer more space for clothes, bed linen, towels and anything else. An ensuite bathroom features a large walk-in shower with glass partition wall and white tiles. Two identical sink basins sit under a big mirror, lit by ceiling spotlights. Cupboards provide plenty of storage space for toiletries. A second double bedroom also features a large double bed with glass doors out to a balcony. Built-in cupboards provide plenty of storage space. A second bathroom is of equal elegance, again with a walk-in shower, large mirror and double sinks. The spacious kitchen features marble work surfaces and a plethora of cupboards to store kitchen equipment. The kitchen also has a glass door opening out onto a balcony, meaning lots of natural light enters the room. It is equipped with a four plate hob cooker and oven, double sink, microwave, large fridge-freezer and washing machine. As well as the dining area, the kitchen also features space for a breakfast or lunch eating area. Air conditioning means this apartment is comfortable even in the heat of summer.